Name Variation Dorothee Elisabeth Friede was also known as Friden. Name Variation Dorothee Elisabeth Friede was also known as Frieden. 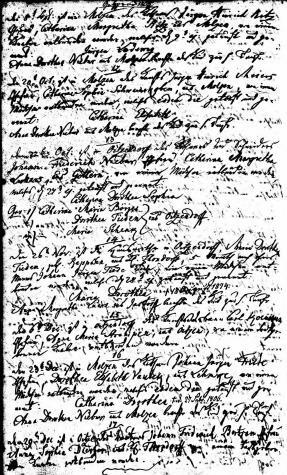 Name Variation Dorothee Elisabeth Friede was also known as Dorothea Elizabeth. She was the daughter of Johann Jürgen Friede and Dorothee Elizabeth Fauteck. 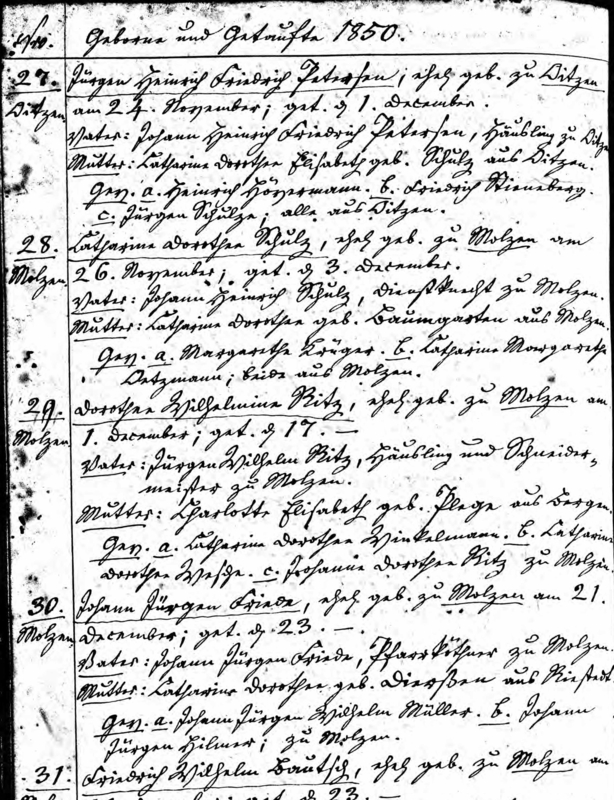 [S392] Lutheran Church, German Lutheran Church Records 1875-1940, Page Number: 72;73. 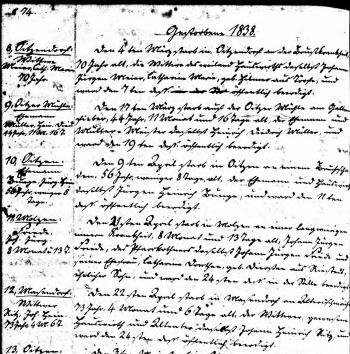 Catharina Dorothea Friede died on 27 January 1806 at Molzen, Uelzen, Hanover, Germany, age 1 month and 3 days. Name Variation Catharina Elizabeth Friede was also known as Fride. 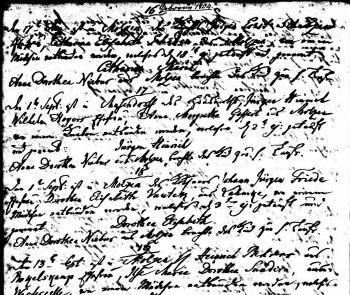 [S407] Lutheran Church, German Lutheran Church Records 1500-1971, Hannover Molzen Taufen, Heiraten u Tote 1767-1817. Film number 470785. 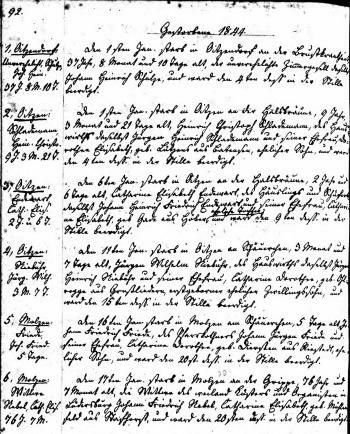 Name Variation Johann Jurgen Friede was also known as Friden. Johann Jurgen Friede was born on 14 April 1810 at Hannover, Germany. He was the son of Johann Jürgen Friede and Dorothee Elizabeth Fauteck. [S407] Lutheran Church, German Lutheran Church Records 1500-1971, Film Number: 470786. 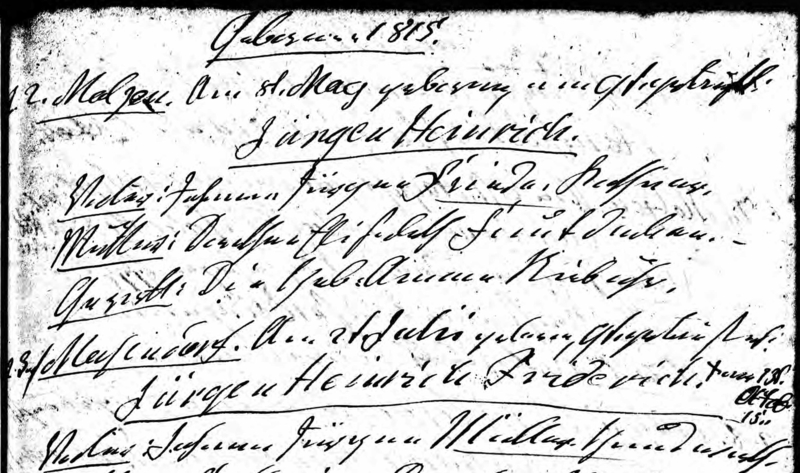 Name Variation Jurgen Heinrich Friede was also known as Jürgen Heinrich Friede. 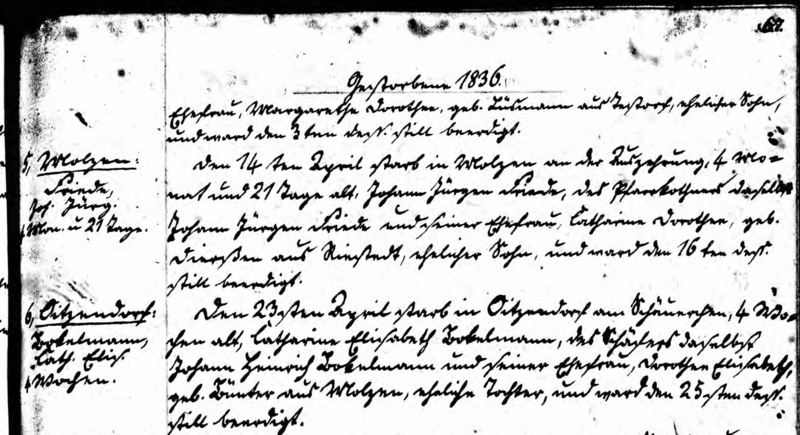 [S407] Lutheran Church, German Lutheran Church Records 1500-1971, Also listed in confirmation record: Hannover Molzen Taufen, Heiraten, Tote u Konfirm 1733-1852. Image 209 of 525. 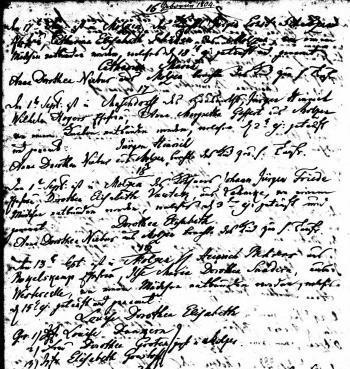 [S407] Lutheran Church, German Lutheran Church Records 1500-1971, Hannover Molzen Taufen, Heiraten, Tote u Konfirm 1733-1852. Image 209 of 525. 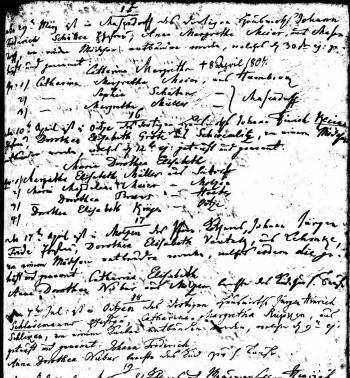 Name Variation Johann Jurgen Friede was also known as Johann Jürgen. 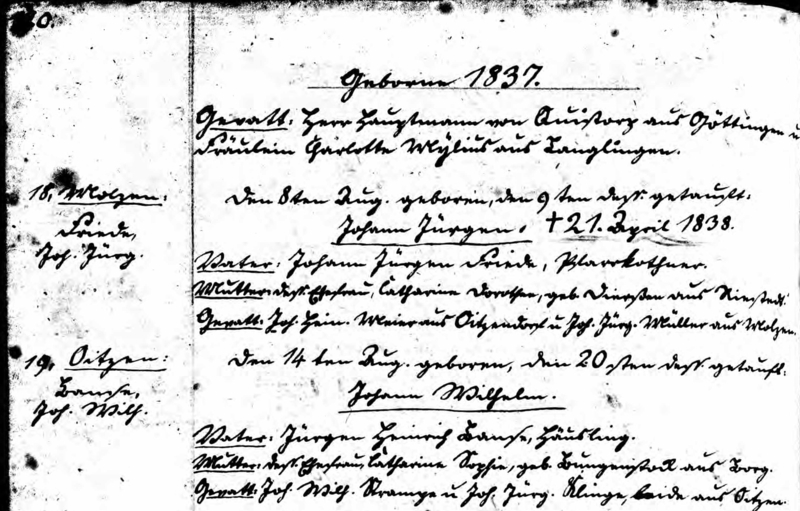 Johann Jurgen Friede was born on 24 November 1835 at Hanover, Germany. He was the son of Johann Jürgen Friede and Catharine Dorothee Dierssen of Riestedt. 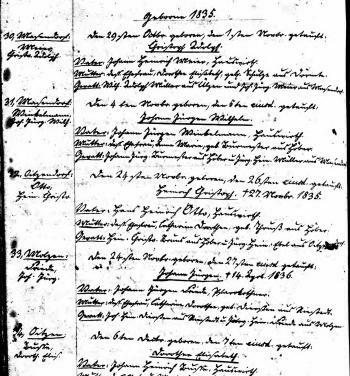 He died on 14 April 1836 at Hanover, Germany. 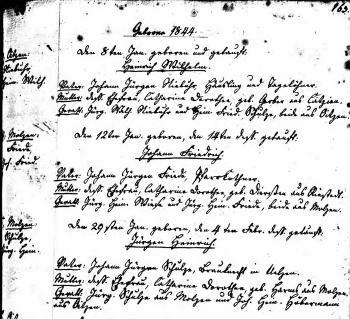 Johann Jurgen Friede was born on 8 August 1837 at Hanover, Germany. 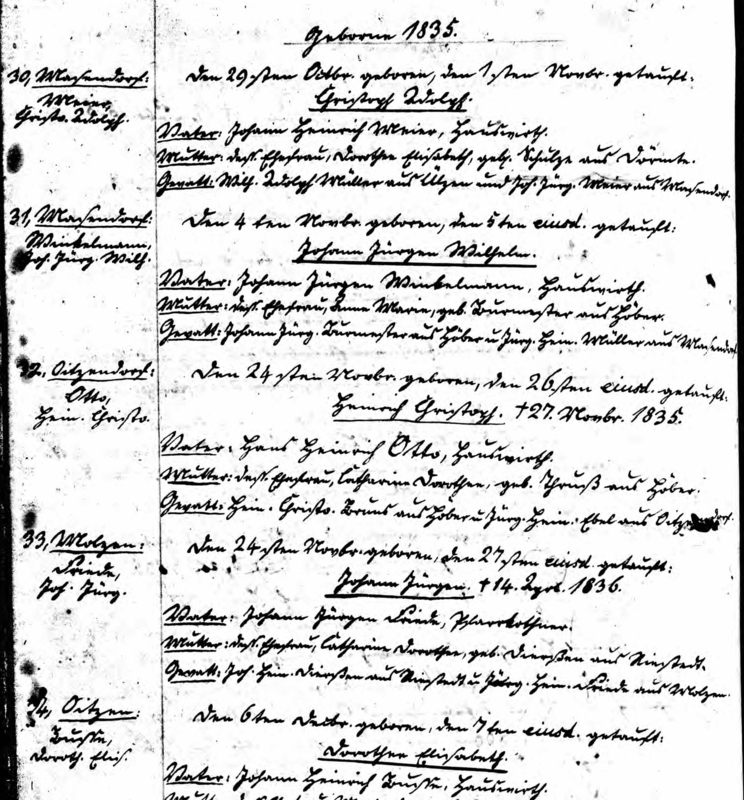 Johann Jurgen Friede died on 21 April 1838 at Hanover, Germany. 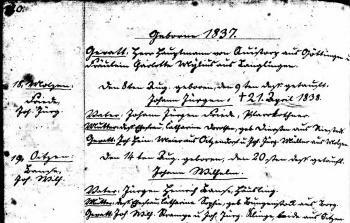 Johann Friedrich Friede was born on 12 January 1844 at Hanover, Germany. He died on 16 January 1844 at Hanover, Germany. 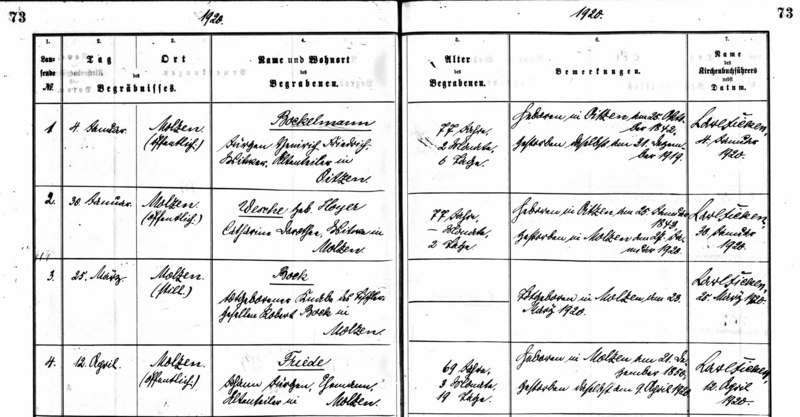 Catharine Dorothee Friede was born on 23 December 1846 at Molzen, Uelzen, Hanover, Germany. She was the daughter of Johann Jürgen Friede and Catharine Dorothee Dierssen of Riestedt. 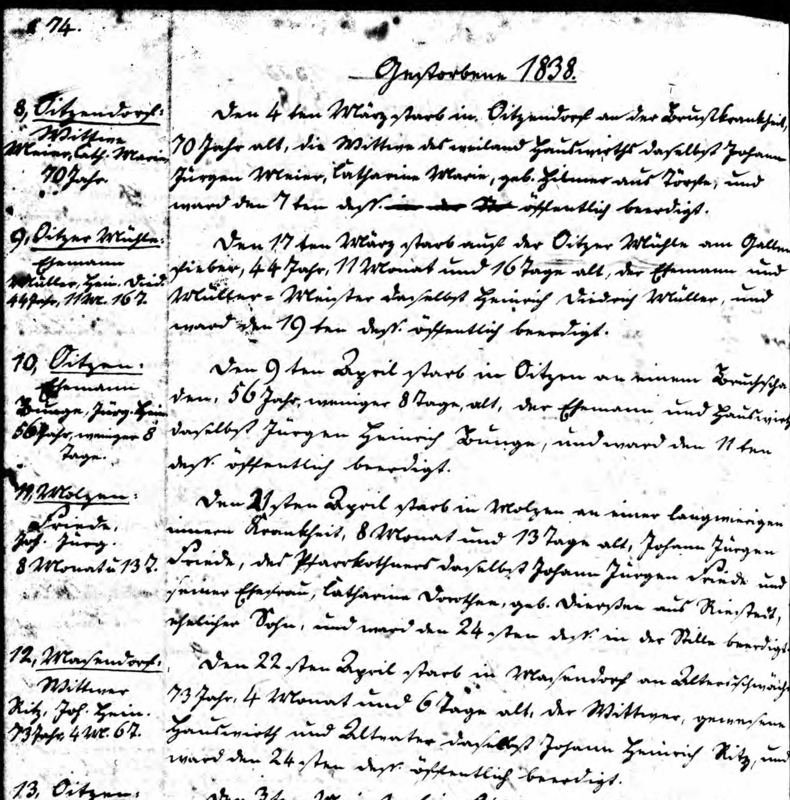 She died on 20 July 1857 at Molzen, Uelzen, Hanover, Germany, at age 10. 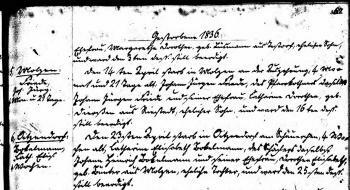 [S392] Lutheran Church, German Lutheran Church Records 1875-1940, Page Number: 26;26. Johann Jurgen Friede was born on 21 December 1850 at Hanover, Germany. 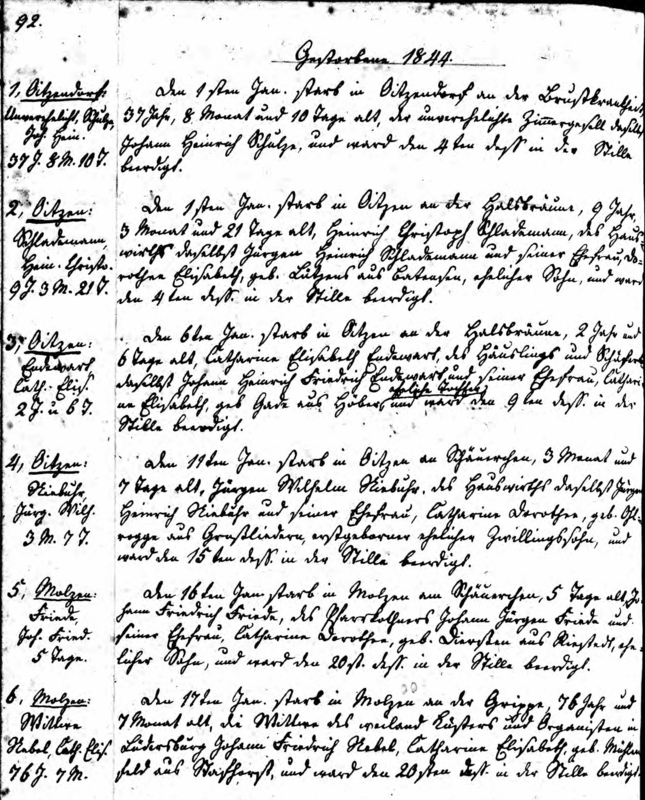 Johann Jurgen Friede died on 9 April 1920 at Molzen, Uelzen, Hanover, Germany, at age 69. He lived in Haus No. 23, Molzen, Germany in the house called the "FRIEDE HOUSE". [S407] Lutheran Church, German Lutheran Church Records 1500-1971, Film Number: 470782. 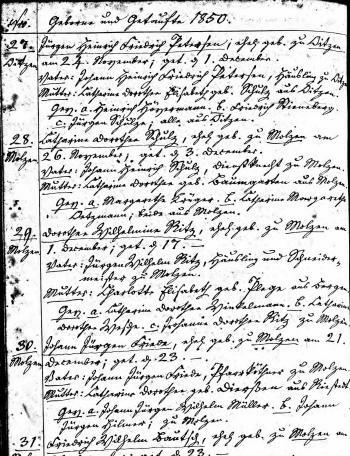 [S392] Lutheran Church, German Lutheran Church Records 1875-1940, Page Number: 73;73. Name Variation Arnold William Frederick Friede was also known as William Fredrick Arnold. He was baptized at Reedsburg, Sauk, Wisconsin, after 12 March 1900. Religion: St. Peter's Lutheran Church. 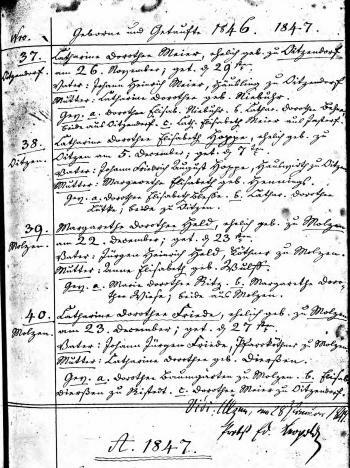 Arnold William Frederick Friede married Adela Louise Magdalene Meyer, daughter of George Meyer and Marie Schumacher, on 4 April 1925. 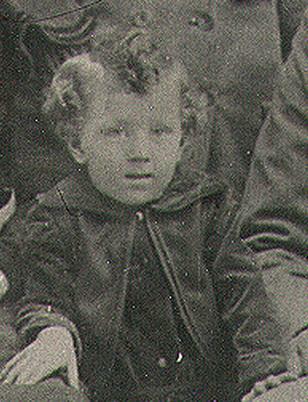 Arnold William Frederick Friede died on 29 July 1956 at died of a heart attack at age 56. Arnold was baptized and confirmed at St. Peter's Lutheran Church, Reedsburg, and attended St. Peter's Christian Day School. During his younger years, he began working for his father who was in the construction business. He worked in Milwaukee and other places in Wisconsin. Later he went into partnership with his father, and with his brothers and brother-in-law. He worked in the construction and building trade all of his life. Adela was a housewife.10 On 12 September 1918 at World War I Draft Registration, Sauk, Wisconsin. On 12 October 1930 Reedsburg Men build air glider, including Arnold Friede. [S6] Wisconsin, Wisconsin Vital Record to 1907, Arnold Friede born 12 Mar 1900 Sauk County Reel 0265 Record 1816. Name Variation William Henry Friede was also known as W. H.
William Henry Friede married Catherine M. Fay, daughter of Matthew D. Fay and Addie H. Keeger, on 20 April 1928. 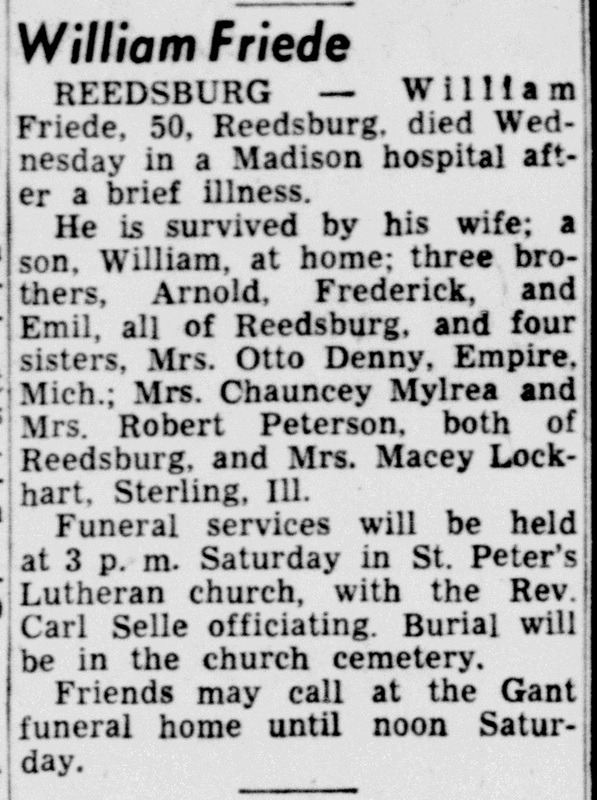 William Henry Friede died on 3 June 1953 at Madison, Dane, Wisconsin, at age 50 William Friede obituary. 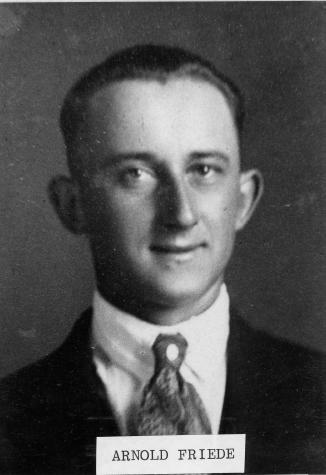 William Henry Friede lived on 1 April 1935 at Chicago, Cook, Illinois. [S6] Wisconsin, Wisconsin Vital Record to 1907, William H Friede born 04 Mar 1903 Sauk County Reel D0003 Record 5429. [S250] U.S. Federal Census 1930 U.S. Federal Census, by Ancestry.com, ED16-1283. Dwelling 33. Name Variation Juanita Elizabeth Dorothy Friede was also known as Tomey. Married Name 26 June 1926 As of 26 June 1926,her married name was Denny. 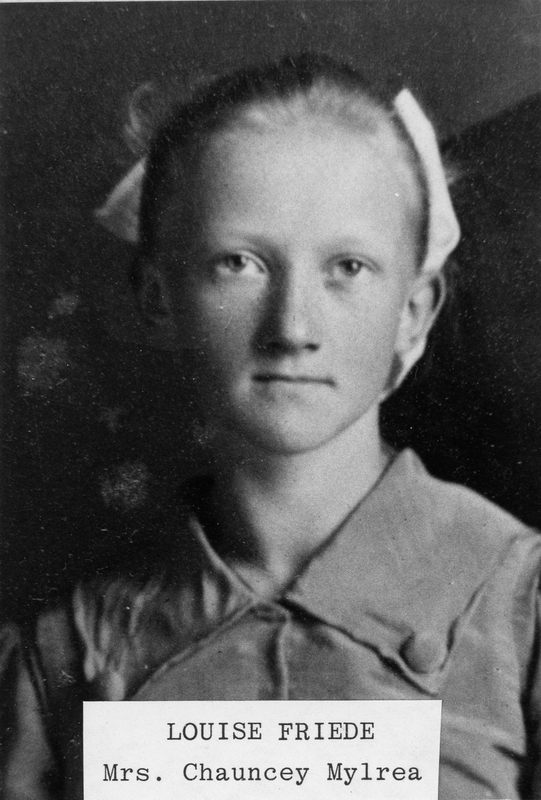 Juanita Elizabeth Dorothy Friede was born on 2 January 1905 at Reedsburg, Sauk, Wisconsin. She was the daughter of William Henry Albert Friede and Louise Emille Augusta Schrank. 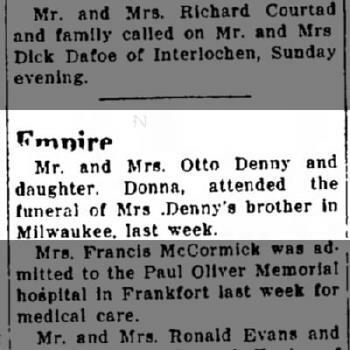 Juanita Elizabeth Dorothy Friede married Otto Fredrick Denny, son of Frank Denny and Sophia Teresa Albrecht, on 26 June 1926 at Milwaukee, Milwaukee, Wisconsin. She was buried after 9 August 1983 at Saint Philip Neri Catholic Church Cemetery, Empire, Leelanau, Michigan. Juanita Elizabeth Dorothy Friede obtained US Social Security Card at Michigan; last residence Maple City, Leelanau, Michigan. 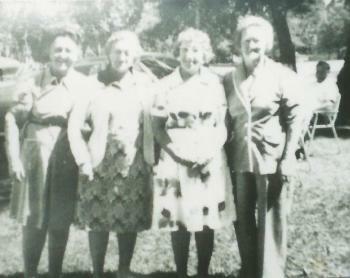 Friede sisters photo - Amanda, Louise, Frieda, Juanita. [S243] U.S. Federal Census 1920 U.S. Federal Census, by Ancestry.com, ED152. Dwelling 196. Married Name 5 December 1931 As of 5 December 1931,her married name was Lockhart. Frieda Marie Friede was born on 15 February 1907 at Reedsburg, Sauk, Wisconsin. 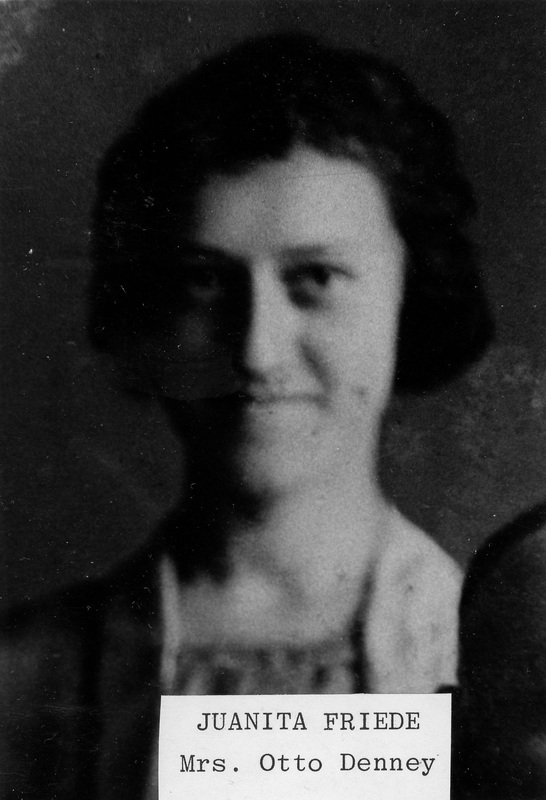 Frieda Marie Friede married Macy James Lockhart, son of Macy Hemphill Lockhart and Pearl Abigail Waite, on 5 December 1931 at Lutheran Church, Milwaukee, Wisconsin. 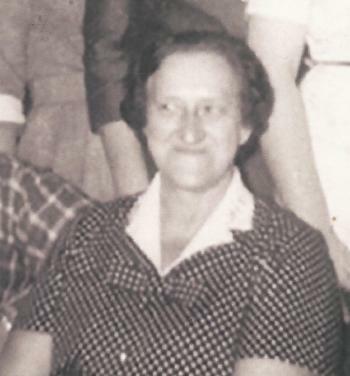 Frieda Marie Friede died on 3 November 1992 at Sterling, Whiteside, Illinois, at age 85. She was buried after 3 November 1992 at Oak Knoll Memorial Park Cemetery, Sterling, Whiteside, Illinois. Twin with Frederick Friede. Frieda's husband Macy was an Electrical Engineer for Northwestern Wire & Steel in Sterling, Ill. for 27 years. Before that he was a self-employed farmer. 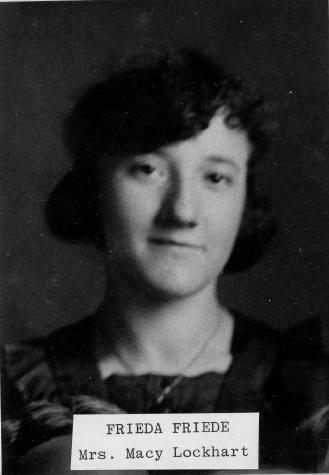 Frieda lived in Sterling, Ill. where she was active in church organizations.5 Frieda Marie Friede obtained US Social Security Card at Illinois. Friede sisters photo - Amanda, Louise, Frieda, Juanita. In September 1951 at Whiteside, Illinois, Macy and Frieda Lockhart assessment of property: $1,400. [S250] U.S. Federal Census 1930 U.S. Federal Census, by Ancestry.com, ED56-30. Ward 2. Dwelling 326a. 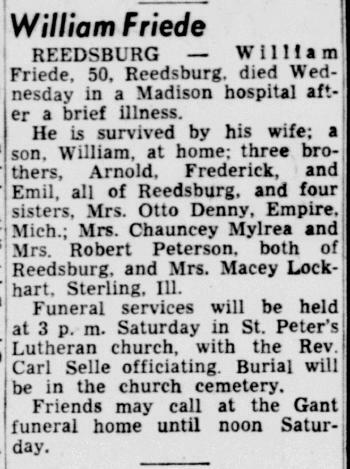 Name Variation Frederick Henry William Friede was also known as Fred H.
Frederick Henry William Friede married Mary Elizabeth Seymour, daughter of Merton Eugene Seymour and Blanche Alma Jeffries, on 4 April 1937 at Methodist Church, Baraboo, Sauk, Wisconsin. 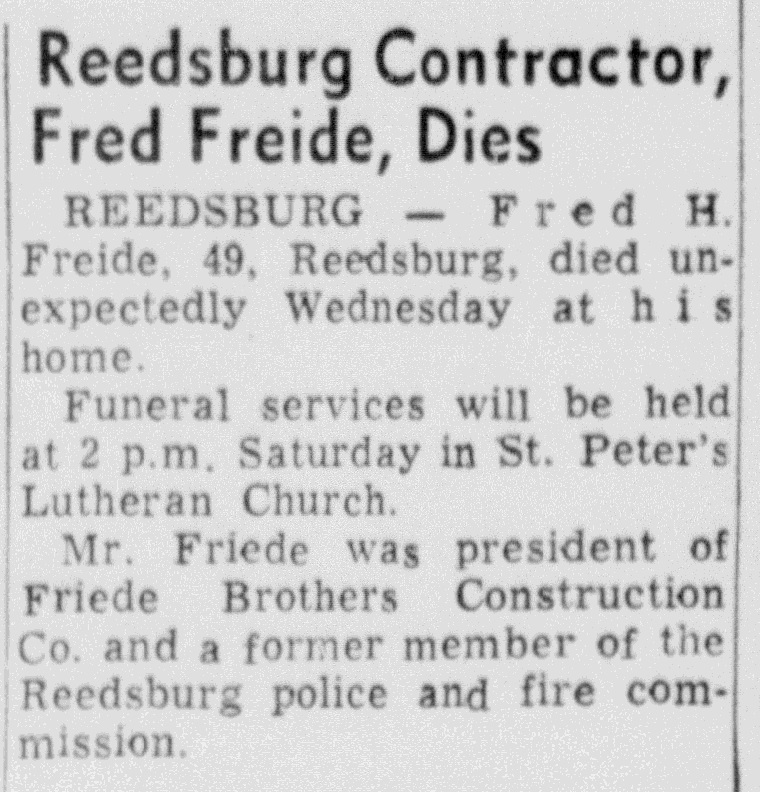 Frederick Henry William Friede died on 20 June 1956 at Reedsburg, Sauk, Wisconsin, at age 49 Fred H Friede obituary. Frederick was born a twin, his sister being Frieda Mary (Mrs. Macy Lockhart). 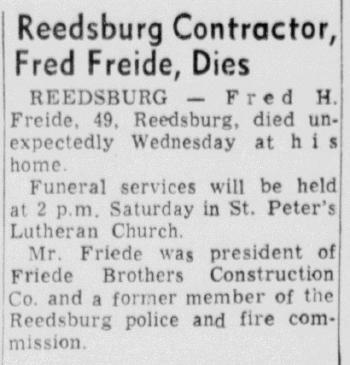 Fred was in the construction business most of his life, and was also a former member of the Police and Fire Commission in Reedsburg.6 Frederick Henry William Friede obtained US Social Security Card at Wisconsin. 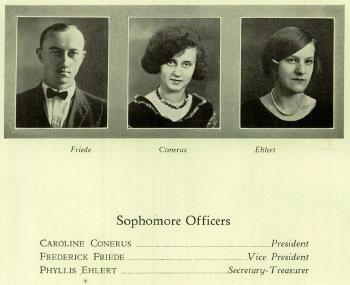 He attended school in 1926 at Reedsburg High School, Reedsburg, Sauk, Wisconsin, sophomore class officer. 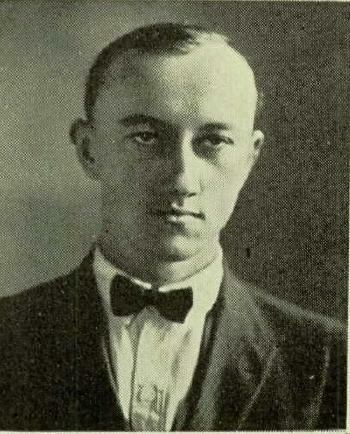 He graduated in 1928 at Reedsburg High School, Reedsburg, Sauk, Wisconsin, Senior class president. [S6] Wisconsin, Wisconsin Vital Record to 1907, Frederick H Friede born 15 Feb 1907 Sauk County Reel D0002 Record 3158. Married Name 24 September 1927 As of 24 September 1927,her married name was Mylrea. 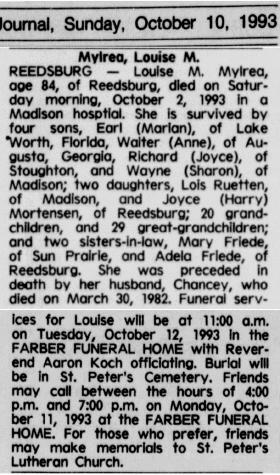 Louise Martha Friede was born on 19 February 1909 at Reedsburg, Sauk, Wisconsin. Louise Martha Friede married Chancey Henry Mylrea, son of Harrison Duncan Mylrea and Emma Hoefs, on 24 September 1927 at Evangelical Lutheran Church, Portage, Columbia, Wisconsin. 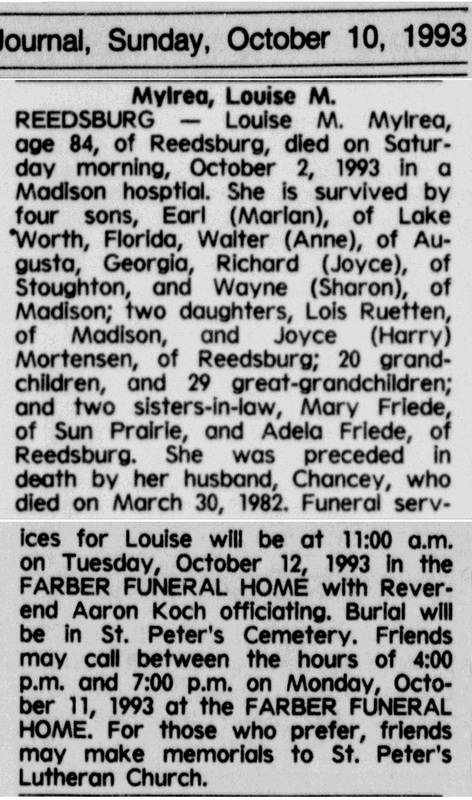 Louise Martha Friede died on 9 October 1993 at Reedsburg, Sauk, Wisconsin, at age 84 Louise M (Friede) Mylrea obituary. Louise Martha Friede obtained US Social Security Card at Wisconsin; last residence Argonne, Forest, Wisconsin. Friede sisters photo - Amanda, Louise, Frieda, Juanita. Name Variation Charles LeRoy McClain was also known as Charlie. 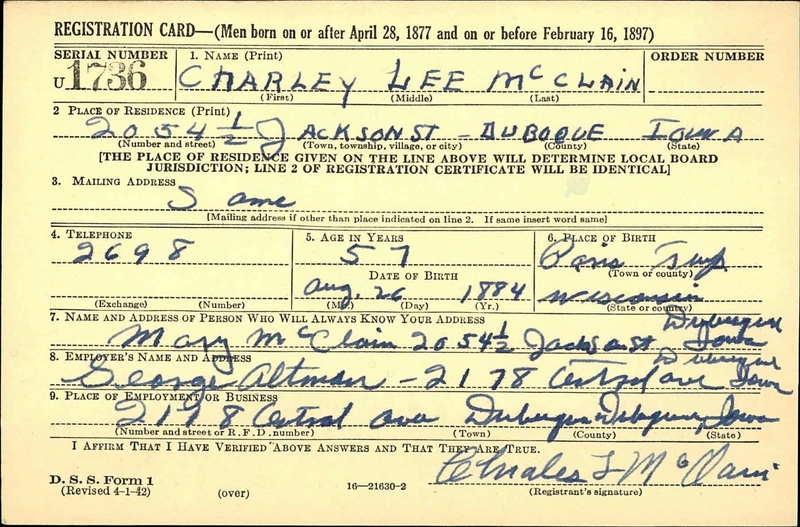 Name Variation Charles LeRoy McClain was also known as Charley Lee. Name Variation Charles LeRoy McClain was also known as Charley Le Roy. Charles LeRoy McClain married Mary May Kreiser, daughter of Henry Godfrey Kreiser and Mary Catherine Ames, on 14 June 1905 at Dubuque, Dubuque, Iowa, Marriage record of Charles L McLain (McClain) and May Kreiser. 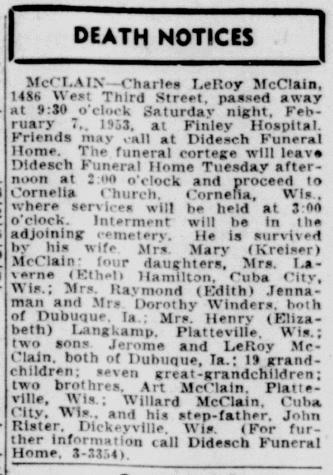 Charles LeRoy McClain died on 7 February 1953 at Finley, Henry, Iowa, at age 68 Charles LeRoy McClain obituary; "Grant County, WI Burials from the Dubuque County, Iowa Death Records starting 1941" copied by Karen Reese. 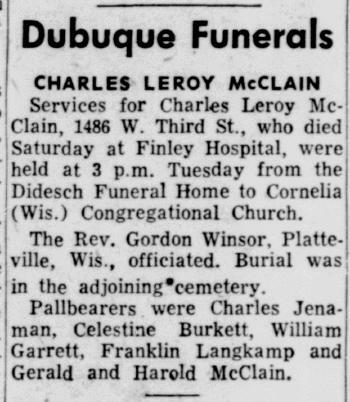 These included: "McClain, Charles Leroy, 68yr, married, stone mason Dubuque Packing Co, born 24 Aug 1884 Wisconsin; parents: George McClain & Laura Shadrick; died 7 Feb 1953 Finley; lived 1486 West 3rd, Dubuque; coronary occlusion; informant: Mary M. McClain; buried 10 Feb 1953 Cornelia. Volume 4 page 16 #10102." He was buried on 10 February 1953 at Mt. Zion (Cornelia) Cemetery, Cornelia, Grant, Wisconsin, Wife Mary May Kreiser McClain is buried in Saint Andrews Cemetery, Grant county, Wisconsin. 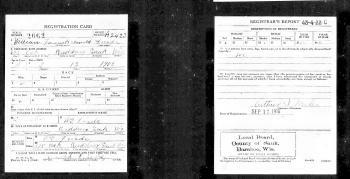 On 12 September 1918 at Grant, Wisconsin, World War I Draft Registration. On 26 October 1928 at Grant, Wisconsin, attended Henry and Mary (Ames) Kreiser 50th wedding anniversary celebration. 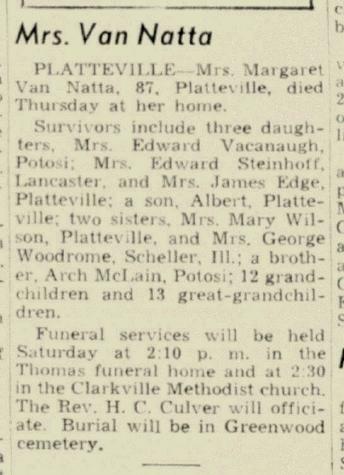 In October 1929 at Grant, Wisconsin, Potosi Couple Hosts to Friends, Relatives. In October 1929 at Grant, Wisconsin, Henry and Elizabeth (McClain) Langkamp entertained friends and relatives at their home, including McClains, Langkamps and Kreisers. In September 1930 at Potosi, Grant, Wisconsin, attended the Kreiser family reunion at the Henry Krieser home. 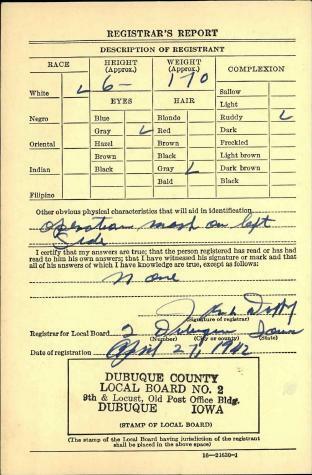 On 27 April 1942 at WWII Registration, Dubuque, Iowa. [S6] Wisconsin, Wisconsin Vital Record to 1907, Charley L McClain born 26 Aug 1884 Grant County Reel 74 Record 2375. [S187] Grant WI Birth Records Birth Records, by Wisconsin, Vol 3- Registry # 2375. 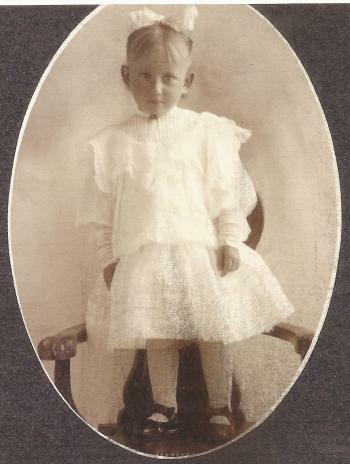 Willard Bliss Mcclain was born at Paris, Grant, Wisconsin, on 17 November 1891. 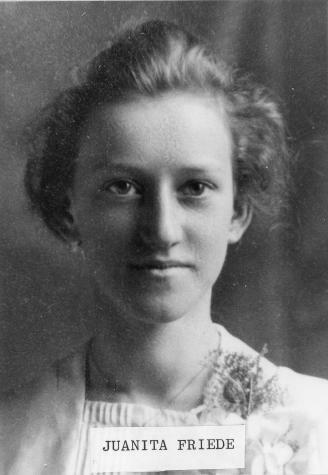 Willard Bliss Mcclain married Anna Barbara Maring, daughter of Michael Maring and Elizabeth Lebben, on 7 January 1913. Willard Bliss Mcclain witnessed the marriage of Marian Elizabeth Bogue and LeRoy Joseph McClain on 23 May 1944; Marian Bogue - LeRoy McClain wedding announcement. 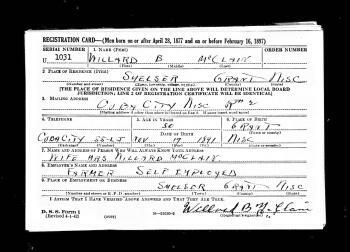 Willard Bliss Mcclain died on 3 February 1956 at at home, Cuba City, Grant, Wisconsin, at age 64 Willard McClain, 64, obituary. He was buried after 3 February 1956 at Cuba City Cemetery, Cuba City, Grant, Wisconsin, presumably Mount Pleasant Cemetery. 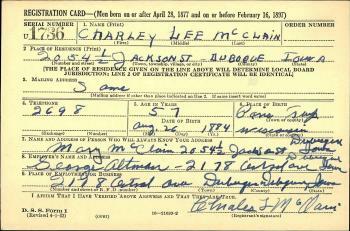 On 5 June 1917 at World War I Draft Registration Cards, Grant, Wisconsin. Willard Bliss Mcclain was educated in 1940 at through 8th grade. 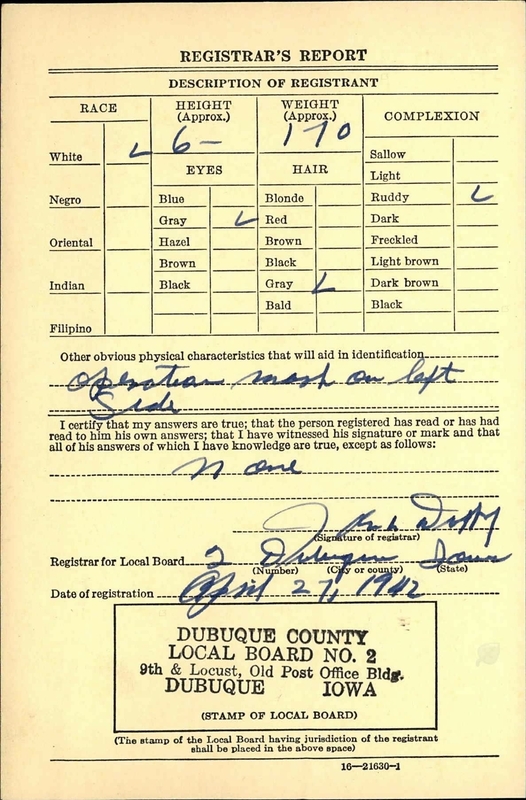 On 27 April 1942 at WWII Registration, Grant, Wisconsin. [S244] U.S. Federal Census 1910 U.S. Federal Census, by Ancestry.com, ED39. Dwelling 13. [S243] U.S. Federal Census 1920 U.S. Federal Census, by Ancestry.com, ED124. Dwelling 12. [S250] U.S. Federal Census 1930 U.S. Federal Census, by Ancestry.com, ED22-51. Dwelling 37. [S373] U.S. Federal Census 1940 U.S. Federal Census, by Ancestry.com, ED22-48. Dwelling 24. Sheet 2a. 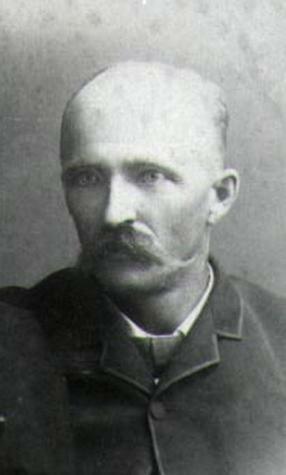 John McClain Jr. was born at Grant, Wisconsin, on 1 October 1853. John McClain Jr. died on 15 April 1937 at Bigford District, Saskatchewan, Canada, at age 83 John McClain, 83, obituary. He was buried after 15 April 1937 at Bigford Cemetery, Swift Current, Saskatchewan, Canada. 1916 Swift Current, Saskatchewan, Canada He appeared on the census of 1916 at Swift Current, Saskatchewan, Canada, living next door to son-in-law William Palmer. John, born in Grant county in 1853, married Miss Grace Thurtell, and lives on his farm and cattle ranch in South Dakota. They have five children. John McClain Jr. and Grace Thurtell were photo. John McClain Jr. migrated in 1886 to . 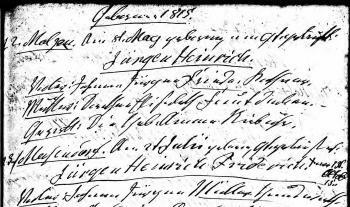 [S5] Wisconsin, Wisconsin Marriages, 1835-1900, McCLAIN, JOHN Jr. to THURTELL, GRACE 30 Jun 1881 Grant WI. Married Name 19 March 1874 As of 19 March 1874,her married name was Wilson. Mary Harriet McClain was born in March 1857 at Grant, Wisconsin. She was the daughter of John McClain Sr. and Ann Rupp. 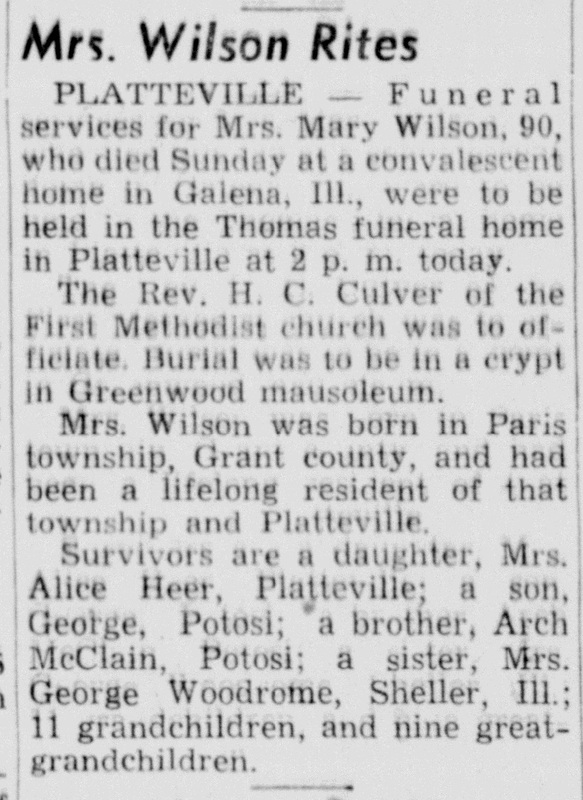 Mary Harriet McClain died on 4 January 1948 at Galena, Jo Daviess, Illinois, at age 90 Mrs. Mary (McClain) Wilson, 90, obituary. 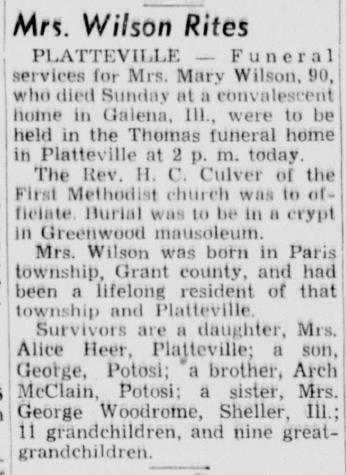 She was buried after 4 January 1948 at Calvary Cemetery, Platteville, Grant, Wisconsin. 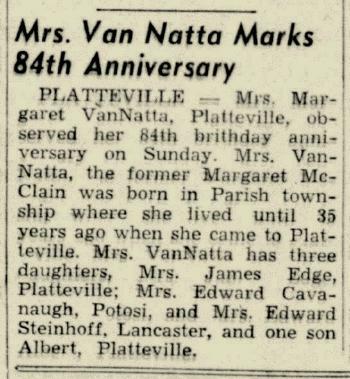 20 June 1895 Platteville, Grant, Wisconsin Mary Harriet McClain is counted on the census of 20 June 1895 in the household of David Parish Wilson at Platteville, Grant, Wisconsin; household includes 3 males and 2 females; all born in the United States. Mary Harriet McClain had 3 with 3 living in 1910 children. [S250] U.S. Federal Census 1930 U.S. Federal Census, by Ancestry.com, ED22-46. Dwelling 181. [S373] U.S. Federal Census 1940 U.S. Federal Census, by Ancestry.com, Year: 1940; Census Place: Platteville, Grant, Wisconsin; Roll: T627_4481; Page: 5B; Enumeration District: 22-43. Name Variation Margaret Catherine McClain was also known as Margaret Katherine. Nickname Margaret Catherine McClain also went by the name of Maggie. Margaret Catherine McClain was born at Paris, Grant, Wisconsin, on 21 July 1859. 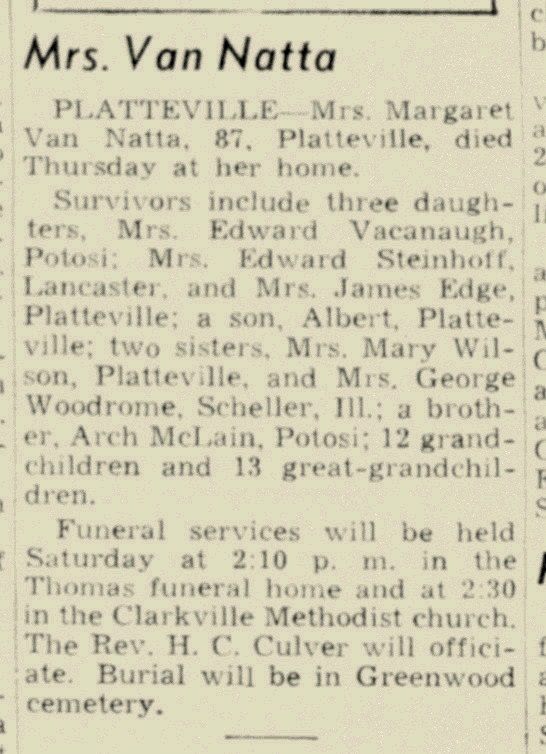 Margaret Catherine McClain died on 8 January 1947 at Platteville, Grant, Wisconsin, at age 87 Margaret (McClain) Vannatta obituary. 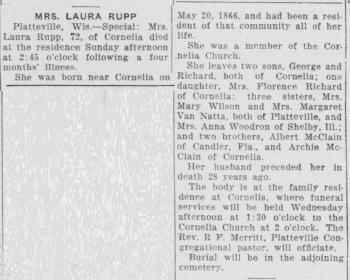 She was buried on 11 January 1947 at Greenwood Cemetery, Platteville, Grant, Wisconsin. 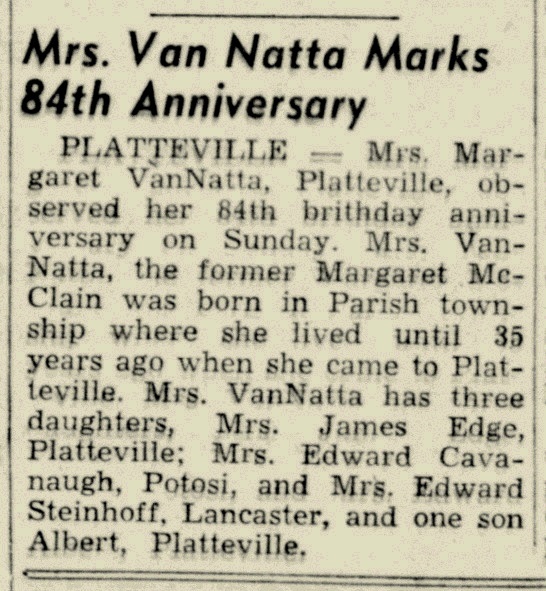 In August 1943 at Platteville, Grant, Wisconsin, Margaret (McClain) Vannatta celebrates her 84th birthday. [S250] U.S. Federal Census 1930 U.S. Federal Census, by Ancestry.com, ED22-46. Dwelling 47. [S373] U.S. Federal Census 1940 U.S. Federal Census, by Ancestry.com, Year: 1940; Census Place: Platteville, Grant, Wisconsin; Roll: T627_4481; Page: 7A; Enumeration District: 22-42. Albert McClain was born at Paris, Grant, Wisconsin, in June 1861. 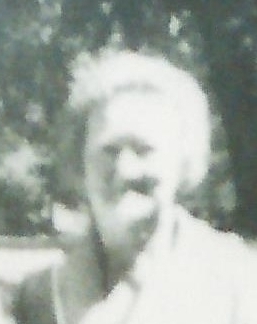 Albert McClain was buried in 1946 at Candler Cemetery, Candler, Marion, Florida. Albert, born in 1861, married Miss Alice Richards, of British Hollow, and lives in South Dakota, where he does an extensive business as a horse dealer, buying for the eastern markets. They have two children. [S327] Ancestry.com, Florida Death Index 1877-1998, Volume: 1193. Certificate: 65??. 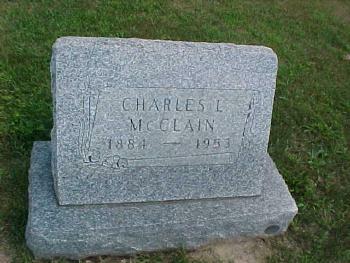 Name Variation Charles McClain was also known as Charlie. Charles McClain was born on 23 April 1864 at Paris, Grant, Wisconsin. 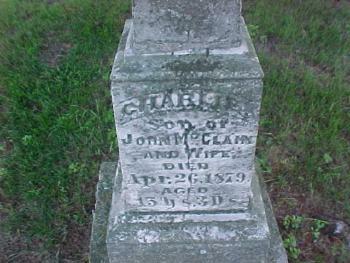 Charles McClain died on 26 April 1879, at age 15. 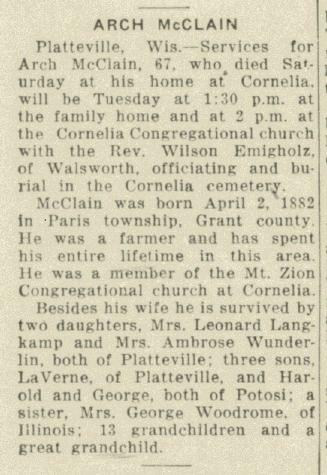 He was buried after 26 April 1879 at Mount Zion Cemetery (aka Cornelia Cemetery), Cornelia, Grant, Wisconsin, 15y 3d. Name Variation Laura McClain was also known as Lora. 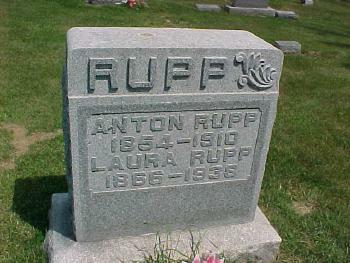 Married Name 5 February 1889 As of 5 February 1889,her married name was Rupp. Laura McClain was born on 20 May 1866 at Cornelia, Grant, Wisconsin. 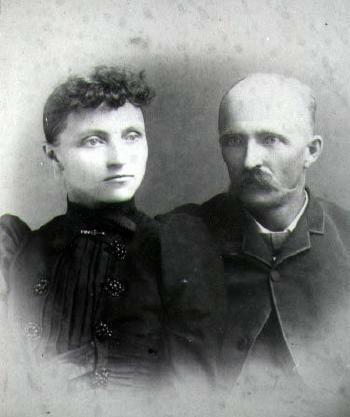 Laura McClain married Antone J. Rupp, son of John Rupp Jr. and Elizabeth Winter, on 5 February 1889. 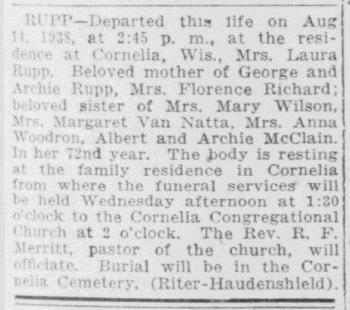 Laura McClain died on 14 August 1938 at Cornelia, Grant, Wisconsin, at age 72 Mrs Laura (McClain) Rupp obituary; also reported as South Dakota. She was buried after 14 August 1938 at Mt. Zion Cemetery, Cornelia, Grant, Wisconsin. In September 1930 at Potosi, Grant, Wisconsin, attended the Kreiser family reunion at the Henry Krieser home. 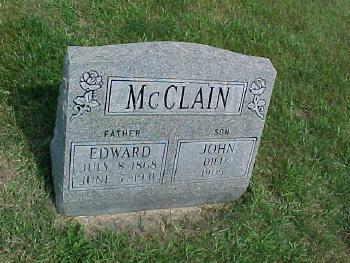 Edward McClain was born at Paris, Grant, Wisconsin, on 8 July 1868. 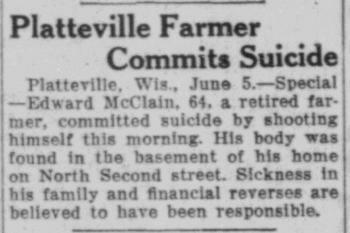 Edward McClain died on 5 June 1931 at age 62 Platteville Farmer commits suicide - Edward McClain; also reported as 07 Jun 1931. He was buried after 5 June 1931 at Mt. Zion (Cornelia) Cemetery, Cornelia, Grant, Wisconsin. Edward, born July 8, 1868, had a good education in the high school at Valparaiso, was for some eight or ten years a miner in Colorado, and now lives at Deadwood, S. Dak. Edward McClain migrated circa 1890 at Wisconsin to to . He migrated circa 1901 at miner in Colorado for 10 years then to . 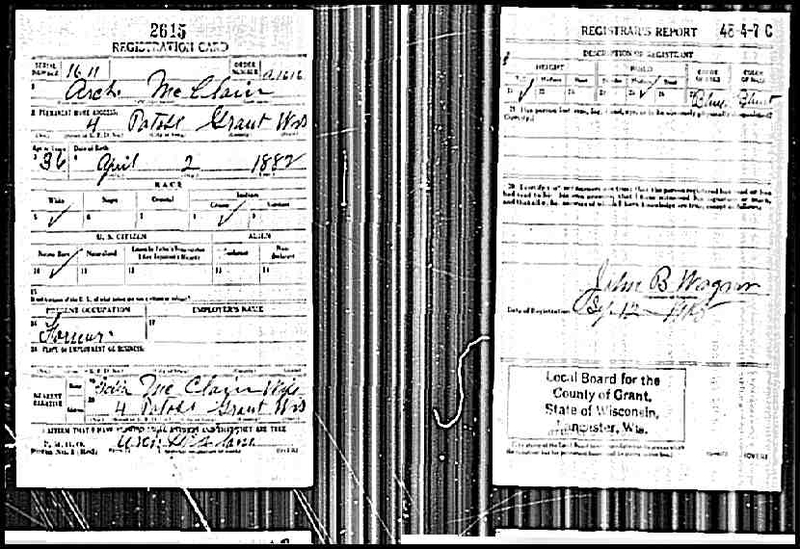 [S6] Wisconsin, Wisconsin Vital Record to 1907, Marriage Record ID: 1549032 vol 09 page 0004. [S244] U.S. Federal Census 1910 U.S. Federal Census, by Ancestry.com, ED39. Dwelling 54. [S250] U.S. Federal Census 1930 U.S. Federal Census, by Ancestry.com, ED22-17. Dwelling 50. Henry McClain was born on 13 September 1869 at Paris, Grant, Wisconsin, also reported as Sep 1870. Henry McClain witnessed the death of Kenneth John McClain in April 1920 at Henry McClain home, Platteville, Grant, Wisconsin; Kenneth John McClain, age 1, obituary. 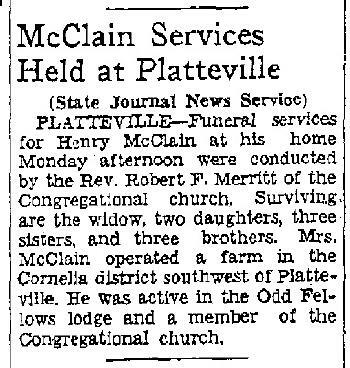 Henry McClain died in April 1937 at Platteville, Grant, Wisconsin, at age 67 Henry McClain obituary. 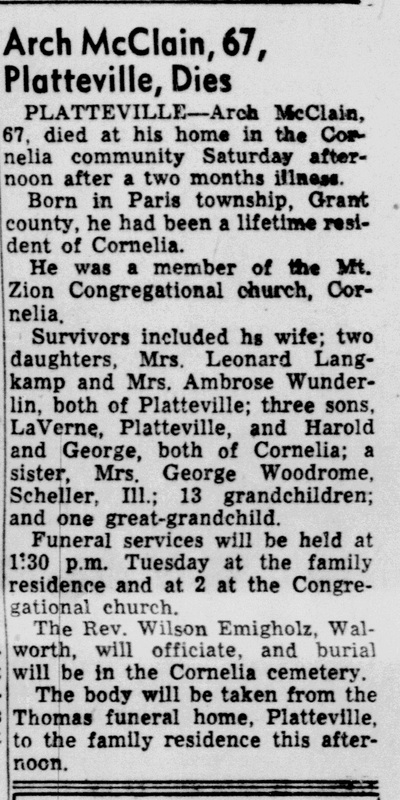 He was buried in April 1937 at Greenwood Cemetery, Grant, Wisconsin. 20 June 1895 Henry McClain is counted on the census of 20 June 1895 in the household of John McClain Sr; household includes 3 males, 2 females; all born in the United States. Henry, born at the present family home in September, 1870, went to the Alaska gold fields in 1895, making three journeys to that region, and met with a rich reward for all his privations and perils. The young man returned in 1899, and is now a resident of his father's home. 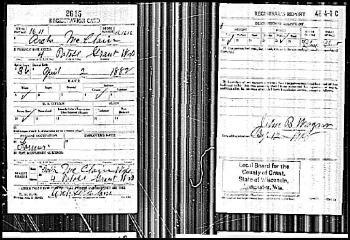 Henry McClain migrated in March 1896 at Wisconsin to, Alaska, date of locating to Alaska: Mar 1896 (from 1900 census). He migrated in 1900 at Alaska to, Wisconsin. [S245] U.S. Federal Census 1900 U.S. Federal Census, by Ancestry.com, Year: 1900; Census Place: Gold Creek, Southern Supervisors District, Alaska; Roll: T623_1830; Page: 81A; Enumeration District: 5. 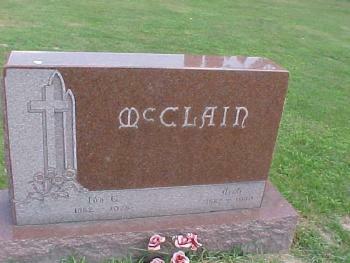 Name Variation Thomas McClain was also known as McLain. Thomas McClain was born at Paris, Grant, Wisconsin, on 3 January 1871; also reported as 7 Nov 1872. He was buried after 11 July 1888 at Mt. Zion (Cornelia) Cemetery, Harrison, Grant, Wisconsin. [S6] Wisconsin, Wisconsin Vital Record to 1907, Volume: 01 Page: 0222 Reel: 030 Image: 0912 Index Volume: - Sequence #: 252304. Name Variation Anna McClain was also known as Annie. Name Variation Anna McClain was also known as Anne. Name Variation Anna McClain was also known as Ann. 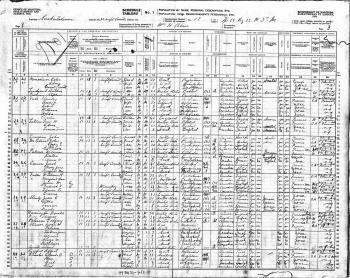 Anna McClain was born at Paris, Grant, Wisconsin, in July 1875; 1900 census lists birth as April 1876. 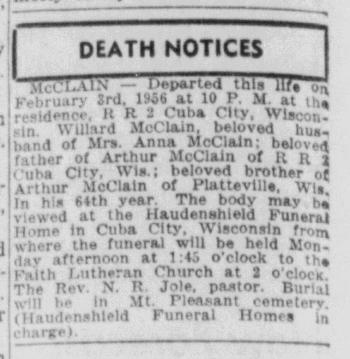 Anna McClain died on 1 March 1963 at Mt. Vernon, Illinois, at age 87 Mrs. Anne Woodrome, 87, of 101 south 26th street died at noon friday at Good Samaritan Hospital. Funeral services will be held at ? :00 p.m. Sunday at the Fry Funeral Home in Waltonville with Herbert Wilson officiating. Burial will be in Bald Hill Cemetery, west of Waltonville. The body will lie in state at the Fry Funeral Home where friends may call after 4:00 p.m. today. 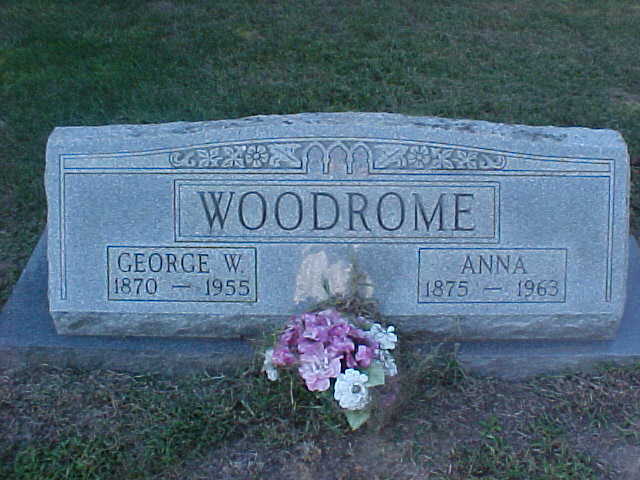 Mrs. Woodrome was born July ?0, 1875, in Potosi, Wis., the daughter of John and Anna (Rupp) McClain. 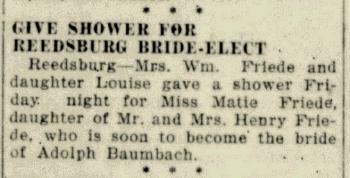 On June 21, 1898 at Potosi she was married to George W. Woodrome, who preceded her in death in 1955. She was also preceded in death by a daughter and 11 brothers and sisters. Survivors include one son, Archie Woodrome of Mt. 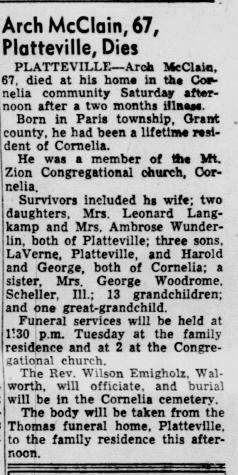 Vernon; two daughters, Mrs. Lee R. Lyons of this city and Mrs. Henry Schroeder of Carbondale; nine grandchildren; 14 great-grandchildren; and one great-great-grand child. 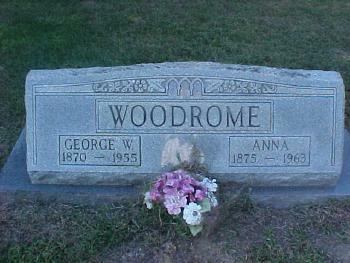 Mrs. Woodrome was a member of the Central Church of Christ. 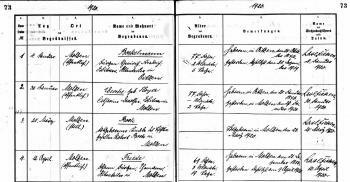 20 June 1895 Anna McClain is counted on the census of 20 June 1895 in the household of John McClain Sr; household includes 3 males, 2 females; all born in the United States. 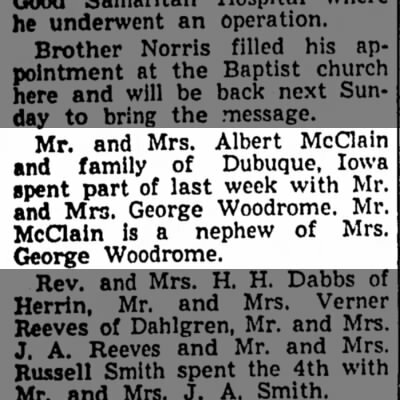 On 6 July 1950 Mr and Mrs Albert McClain and family of Dubuque, Iowa spent part of last week with Mr and Mrs George Woodrome. Mr McClain is a nephew of Mrs George Woodrome. Mt Vernon Register-News (Mt Vernon, IL). 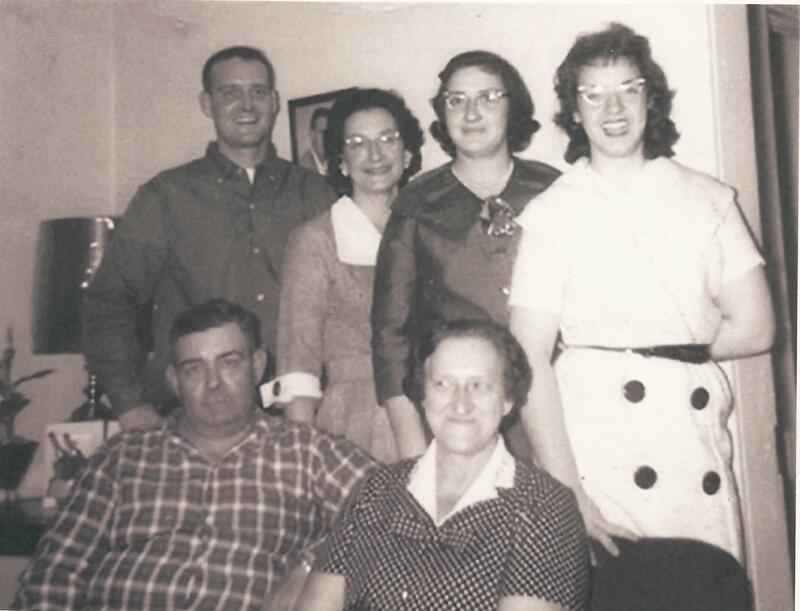 In August 1952 at Illinois Mr. and Mrs. George McClain and daughter and Mrs. Ida McClain of Potosi, Wis., were breakfast guests of Mr. and Mrs. George Woodrome Monday. Name Variation Archibald John McClain was also known as Arch. Name Variation Archibald John McClain was also known as Archie. Archibald John McClain was born on 2 April 1882 at Paris, Grant, Wisconsin. Archibald John McClain married Elizabeth Ida Kreiser, daughter of Henry Godfrey Kreiser and Mary Catherine Ames, in 1909. 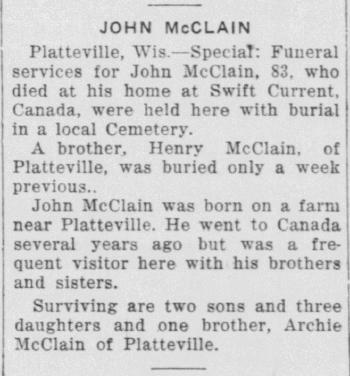 Archibald John McClain witnessed the death of Kenneth John McClain in April 1920 at Henry McClain home, Platteville, Grant, Wisconsin; Kenneth John McClain, age 1, obituary. 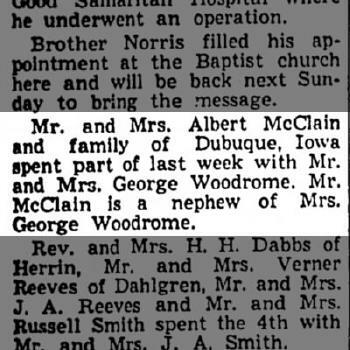 Archibald John McClain, as the father of the bride, attended the wedding of Ambrose Stephen Wunderlin and Marie Anna McClain on 14 October 1936 at Holy Ghost Church, Dickeyville, Grant, Wisconsin; Anna Marie McClain and Ambrose Wunderlin marriage announcement. 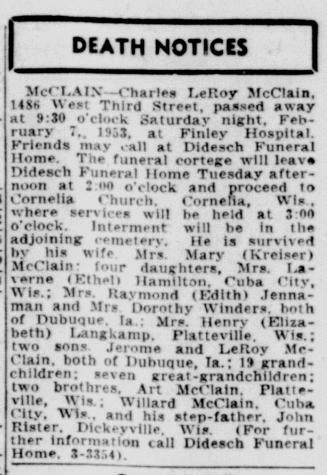 Archibald John McClain died on 15 November 1949 at home, Cornelia, Grant, Wisconsin, at age 67 Arch McClain, 67, obituary. He was buried on 18 November 1949 at Mt. Zion (Cornelia) Cemetery, Harrison, Grant, Wisconsin. 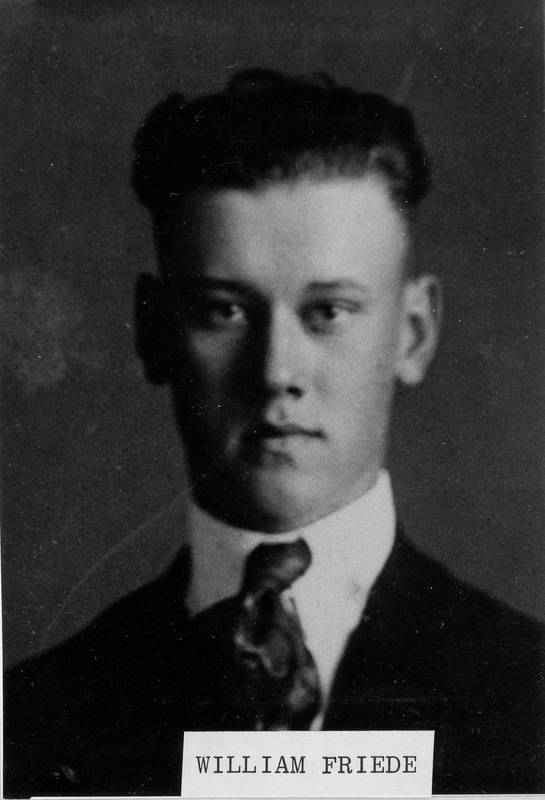 Archie, born in April 1882, was a student in the Normal, preparing at Platteville for a teacher's career, and is now at home. On 12 September 1918 at Grant, Wisconsin, World War I Draft Registration. On 26 October 1928 at Grant, Wisconsin, attended Henry and Mary (Ames) Kreiser 50th wedding anniversary celebration. 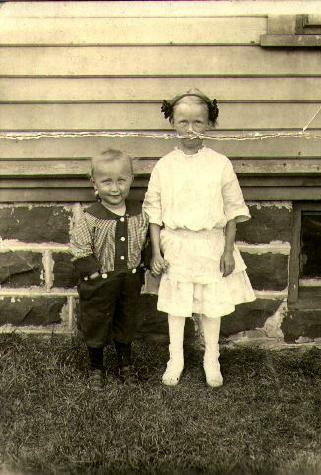 In October 1929 at Grant, Wisconsin, Potosi Couple Hosts to Friends, Relatives. In October 1929 at Grant, Wisconsin, Henry and Elizabeth (McClain) Langkamp entertained friends and relatives at their home, including McClains, Langkamps and Kreisers. In September 1930 at Potosi, Grant, Wisconsin, attended the Kreiser family reunion at the Henry Krieser home. 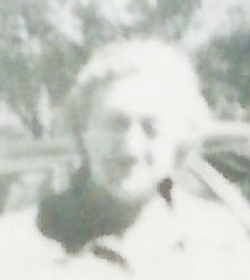 Archibald John McClain was educated in 1940 at through 1 year of college. Married Name 30 June 1881 As of 30 June 1881,her married name was McClain. Grace Thurtell was born on 26 March 1859 at Grant County, Wisconsin. She was the daughter of Edward Brookes Thurtell and Amy Burns. Grace Thurtell died on 13 March 1926 at Bison, Perkins, South Dakota, at age 66. She was buried after 13 March 1926 at Bison Cemetery, Perkins, South Dakota. Grace Thurtell The entry about Ransom B. Folts in the 1901 Biographical Sketch Book of Grant County, Wisconsin, shows his wife's sister, Grace Thurtell, was the wife of John McKann of South Dakota. 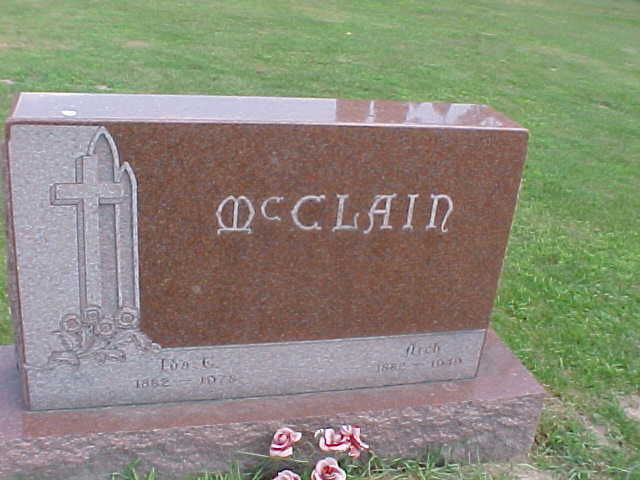 The entry for John McClain shows his daughter-in-law, Grace Thurtell McClain, and her husband, John McClain, were living on their farm and cattle ranch in South Dakota and had five children, John, Grace, Bertha, Glenn, and Henry. She is listed in the 1880 U.S. Census for the Town of Jamestown, Grant County, Wisconsin (SD 2, ED 110, Page 3), enumerated June 2, 1880, as Grace Thurtle, age 21, single, born in Wisconsin, living with her widowed mother, Anna Thurtle, and her siblings Frederick, age 25, a miner, Harriet, age 23, and Belle, age 19, whose occupation is teaching school. Grace and John McClain are listed in the 1900 U.S. Census for Meade County, South Dakota (Volume 11, SD 1, ED 34, Sheet 7, Line 29) living in the second ward of the City of Sturgis, Sturgis Township, Meade County, South Dakota. 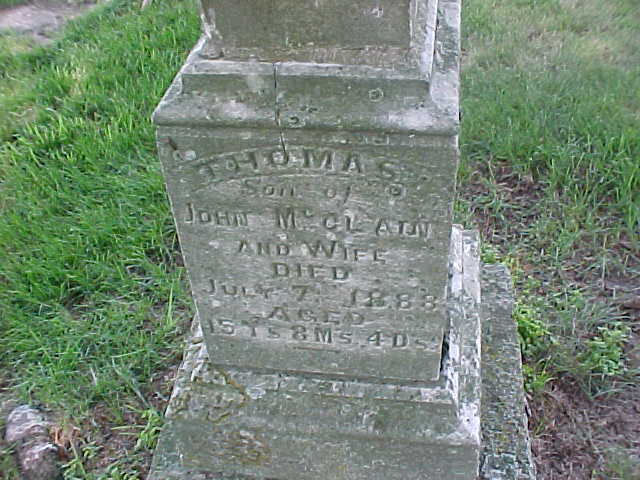 John McClain is shown as age 46, born in Wisconsin in October 1853, with his father born in Tennessee and his mother in Pennsylvania. He owned their home with no mortgage and had no months of no employment, with his occupation shown as stock raiser. He and his wife, Grace McClain, had been married 19 years according to this census. 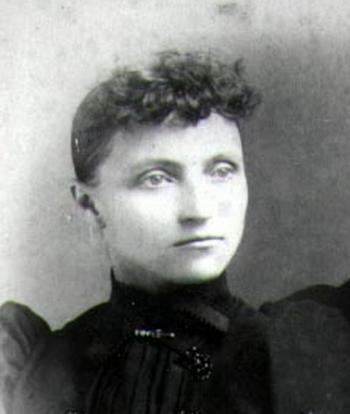 She is shown as age 40, born in March 1860 in Wisconsin, with her father born in England and her mother in Indiana. She is the mother of five children, all living with their parents. 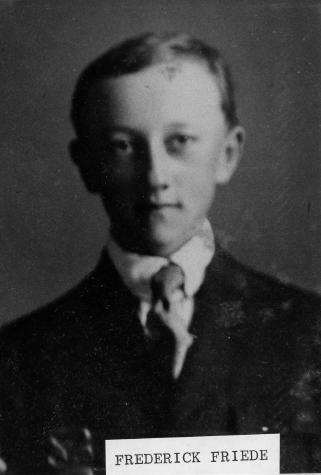 John E. McClain is shown as age 15, born in Wisconsin in May 1885, and at school. The four younger children were all born in South Dakota. Grace L. McClain is 10, born in February 1890, and is also in school. Bertha M. McClain, age 7, born in December 1892, is at school also. Leo G. McClain, age 5 and born in March 1895, and Henry C. McClain, age 3 and born in December 1896, are not yet in school. 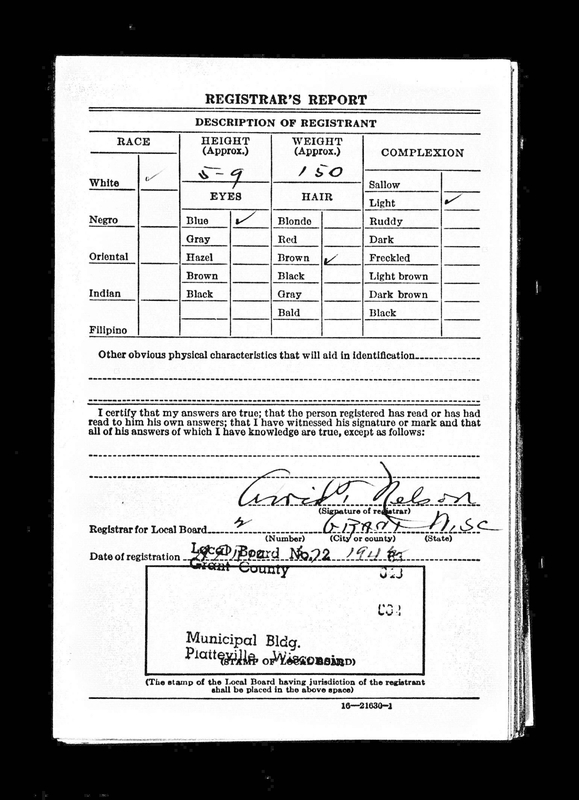 Grace McClain is listed as head of the household in the 1920 U.S. Census(Volume 23, Enumeration District 175, Sheet 5, Line 17) in Scotch Leap Township, Perkins County, South Dakota. She is shown as age 60 born in Wisconsin, with her father born in England and her mother in North Carolina. She is shown as a farmer, operating a farm she owns on her own account, and is listed as married and able to read and write English. With her is her son, Henry C. McClain, age 22, born in South Dakota, with his father born in the United States and his mother born in Wisconsin. He is shown as single and a farm laborer working on the home farm and is able to read and write English. Grace Thurtell, 1859-1926, born in Wisconsin, is listed among the pioneers in the Sioux Valley Genealogical Society, Sioux Falls, South Dakota 57104, on a web site found in October 1999 at http://www.rootsweb.com/~sdvgs/index19.htm. The web site shows she was issued a Pioneer Certificate at the request of family members or interested parties as a resident in the Dakota Territory prior to statehood in November 1889. A database index of Bureau of Land Management Records found on the internet in January 2000 athttp://www.rootsweb.com/~usgenweb/sd/land/perkins.htm shows that John and Grace McClain and John E. McClain (possibly their son) had five different land patents in Perkins County, South Dakota, all at the 7th Meridian,Township 018 N, Range 012 E, in Sections 8 and 9. John McClain had two homestead patents dated May 26, 1908. The one in Section 8 was for 120 acres, with a document identification number 3645. The same document identification number is also referred to a homestead of 40 acres in Section 9. Document number 108181 dated February 1, 1910, is indexed to cash sales of 120 acres in Section 8 and 40 acres in Section 9 to John E.McClain. Document identification number 447193 dated December 5, 1914,refers to a cash sale of 80 acres to Grace McClain in Section 8. She and John McClain Jr. were photo. Children of Grace Thurtell and John McClain Jr.